The world's first mixed reality VR coaster is coming to Six Flags Magic Mountain and Six Flags Discovery Kingdom for 2017! 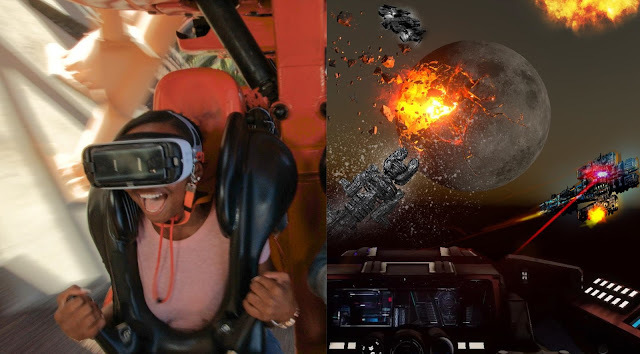 "The New Revolution Galactic Attack" will be the latest virtual reality offering from the amusement park chain's partnership with Samsung and Oculus. It claims a world record by being the first virtual reality experience on a roller coaster that combines the real world with the virtual one. The attraction will utilize the Samsung VR Headset's camera to combine riders' actual surroundings with virtual reality graphics in real time. The experience will begin once riders board the coaster and secure their Samsung VR Headsets. After safety checks and ride dispatch, the adventure kicks into high gear. Cresting the lift hill, a massive, swirling wormhole comes into view. As riders drop at high speeds, the mixed reality view changes to a completely immersive, virtual reality environment and a fighter spaceship cockpit materializes and envelops the riders into a tunnel of light. At the bottom of the first hill, riders are launched into the middle of a space battle, coming under attack from flying drones firing lasers and missiles. After swinging through tight channels, narrowly dodging drones and artillery fire, riders are brought into one of three drone bays, each of which offer a completely different gaming experience and three different endings. This new experience is free with admission to all guests, and will open February 20, 2017 at Six Flags Discovery Kingdom and February 25, 2017 at Six Flags Magic Mountain. Additionally, guests can gain early access to the attractions during February 18-20 by being a season pass holder or donating a full bag of non-perishable foods for local food banks (Front of the line wristbands will be given to Discovery Kingdom participants on February 20). That's all for now from Theme Park Overload! Make sure to "Like" our Facebook page for Breaking News Updates and Live In-Park Content! Facebook.com/ThemeParkOverload My name's Nicholous, and Thanks for Reading!